On Friday night my good friend Dean invited me out to see Enuff Z'nuff at Troubadour. Dean is friends with original lead singer Donnie Vie although Donnie is currently not part of the touring lineup. We get to show just as the opening band was wrapping up. The venue was still pretty empty. About half an hour after we arrive the guys from Enuff Z'nuff get on stage and begin their set. I didn't really know what to expect, I had their first cd back in the day and they just seemed like another glam rock band in the 80s, but through the years I've read many reviews comparing them to Cheap Trick and how Enuff Z'nuff have been creating great power pop for nearly the last 20 years. The mix of the band was pretty bad, especially where we stood. However you could tell the band sounded pretty tight and the vocals were great. Chip Z'nuff was playing a 12 string bass and at one point played the bass riff of Cheap Trick's Gonna Raise Hell as an intro to one of their songs. At the end of the set Donnie Vie showed up and jumped on stage for New Thing. Donnie sounded great. They played another couple of songs and these were by far the best sounding songs of the set. The band was relaxed and Donnie's voice was a much better fit on vocals. Donnie worked the crowd and convinced the band to play a couple extra songs. On the last go round it looked like he was over staying his welcome on stage with Chip Z'nuff, but they got through the last song with no problems. Afterwards the band headed upstairs to the back stage area of club. Dean and I stayed on the floor waiting for the next band Britny Fox. I actually saw Britney Fox open for Poison back in 1988. I don't remember much other than their two hits Long Way To Love and Girlschool. They came out and the first thing I noticed was the band looks too young. All the guys looked to be in their late 20s or early 30s except for the bass player. Turns out the bass player is the only original member of the band. Seems wrong to pass off your band with only the original bass player but then Dean pointed out to me that Enuff Z'nuff's bass player is also the only original member. About 3 or 4 songs into the set Donnie's wife comes and gets Dean and I and we head up to see the band. The backstage area had a ton of people crammed into this tiny space. The smoke nearly over took me. We were up there about 10-15 minutes and talked to a few people before we headed outside. On the way out I got to hear one of Britny Fox's hits Long Way To Love. Outside we ended up talking to Donnie and Chip and strangely Jerry Cantrell from Alice In Chains was hanging out on the street with his brother. He came by and said hi to Chip. We heard a some of Chip's and Donnie's stories and had a few good laughs. We ended up talking to them for a few more minutes outside of Dan Tana's. Eric Stacy from Faster Pussycat also came over and ended up going in with the guys and a larger group of people for a late dinner. 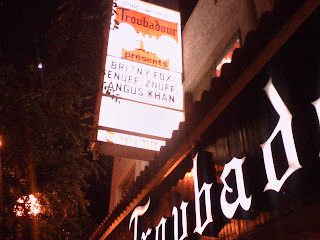 Dean and I passed on eating with them and ended up wrapping up the night back at the Troubadour.